This fascinating, 32-page book on farming gives an insight into everything from sowing seeds to shearing sheep. 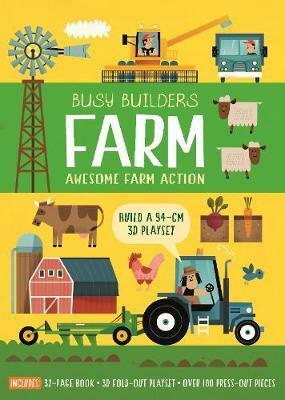 Build your own 94-cm farm playset! The perfect package for budding farmers, this illustrated 32-page book features detailed, labelled illustrations of all aspects of the running of a farm, from sowing to harvesting, which vehicles are needed for which job and how to handle livestock. The box opens up and transforms into a busy farm, allowing the reader to gain an insight into farm life through active play. Punch out and slot together the barn, farmer, vehicles and animals (including cow, sheep, pigs and hens), and piece together the jigsaw puzzle farm track to take you on a journey through fields of tasty crops and orchards ripe with fruit.